Montana suffragist Jeannette Rankin was elected to the U.S. House of Representatives on this day in 1916. She was the first woman ever to win a seat in the federal Congress. Rankin was the daughter of progressive parents who encouraged her to think outside of the early 20th century box into which she was born. She worked briefly as a social worker after graduating from the University of Montana and the New York School of Philanthropy, and was very involved in the Women’s Suffrage Movement. With the vote for women secured, Rankin ran for a seat in Congress in 1916, as a Progressive Republican, and won. 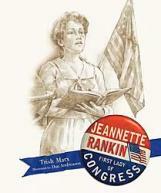 A dedicated pacifist, Rankin’s first vote as a U.S. congresswoman was against U.S. entry into World War I. It was that vote against WWI that led to her defeat in her 1918 reelection bid. No longer a Congresswoman, Rankin continued to work for the cause of peace for the next 20 years. In 1940, she again won a seat in the U.S. House of Representatives, just as the nation was about to enter World War II. Following the bombing of Pearl Harbor in December of 1941, Rankin became the only person in the history of Congress to vote against U.S. entry into both world wars. 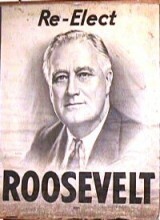 In 1944, President Franklin Delano Roosevelt was elected to an unprecedented fourth term in office. FDR remains the only president to have served more than two terms. In 1947, Congress proposed a law that would limit presidents to two consecutive terms. Up to that time, presidents had either voluntarily served a maximum of two terms, set forth by George Washington’s example, or were unsuccessful in winning a third. The 22nd Amendment to the Constitution, officially limiting a president’s tenure in office to two terms of four years each, was passed in 1951. On this day in 1972, Richard Nixon defeated Senator George McGovern (D-South Dakota) and was re-elected President of the United States. With only 55 percent of the electorate voting, the lowest turnout since 1948, Nixon carried all states but Massachusetts, taking 97 percent of the electoral votes. The arrest of five men connected with Nixon’s re-election committee, for breaking into the Democratic Party’s national headquarters in the Watergate apartment complex in Washington, D.C., went virtually unnoticed. 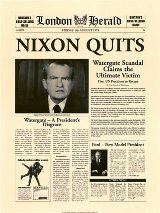 Two years later, in August of 1974, The Watergate scandal broke and Nixon resigned from office. previous post: Voting Registration – I Am Voting. Are You? 51 queries in 0.621 seconds.